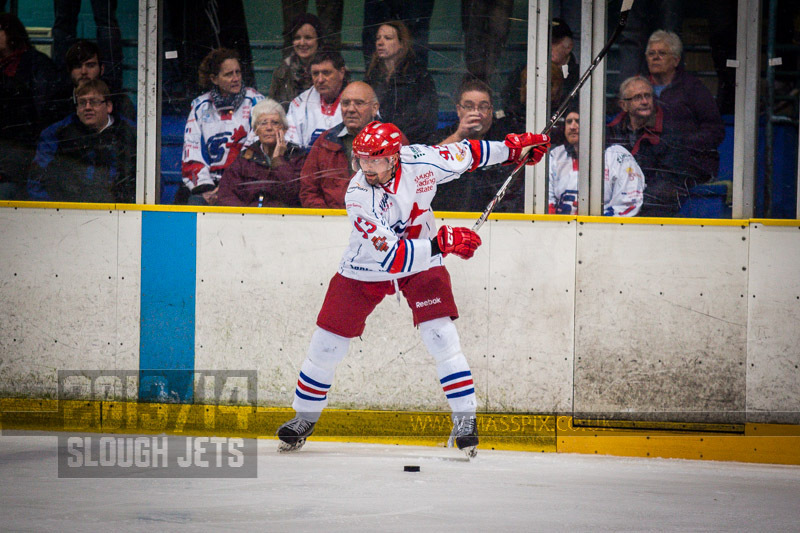 Slough Jets welcomed Milton Keynes Lightning to the Hangar and the teams re-established rivalry for the first time since the play-off quarter finals last season. Darius Pliskauskas was the first player on the scoresheet as the home team took the lead at 6.33 when the sniper finished from Slava Koulikov and Dan Scott at 11.52 it was all level after Connor Goode equalised from Ross Bowers. The period looked to be heading to a 1-1 tie when Michael Wales put the home team back ahead with a powerplay goal at 19.59 on the brink of the buzzer. The middle period saw Slough to continue to dominate the shots but after 3.24 Adam Carr levelled up at 2-2 with the period’s only goal. The visitors lost Ross Bowers for 12 minutes at 37.16 when he added a 10 minute misconduct to his interference penalty. The final period saw the home team get off to an inspired start and they dominate the attacking. Stephen Wall kept his team in the game and it was a late powerplay goal from Stanislav Lascek that put the visitors ahead for the first time with 1.55 remaining. Slough took their time out after the goal and Gregg Rockman left the net at 58.28 for the extra attacker. Milton Keynes defended deep in their own zone and took their own time-out at 59.12 and hung on to their lead upto the final buzzer. After a sprightly start by both teams it was the visitors who took the lead at 5.49 when Blaz Emersic netted the first goal. Despite outshooting their opponents by 4 shots the home team found themselves still behind by that goal at the first interval. The second period passed by quickly with the teams trading powerplays but neither finding the back of their opponent’s net. Milton Keynes doubled up their lead at 44.14 when Juraj Gracik netted but Dan Davies kept Slough in the game with the home team’s first of the night at 44.40. Slough again outshot their opponents and despite man of the match Ryan Watt coming together with Michael Wales and sparking on his team it came down to the final minute and when Gregg Rockman left the net for the extra attacker Lukas Zatopek found a path home for the puck to seal the victory. Telford Ice Rink hosted Slough Jets for the first time since 2009 when they made the journey to face the Tigers. Both teams coughed up early powerplays before Chris Allen and Joe Greener both took double minors. The home team then picked up another penalty and Slough capitalised on the advantange with Darius Pliskauskas scoring at 8.06. The same player also scored to double the lead with just 11 seconds left in the first period. Another powerplay in the second period saw Shaun Thompson make it 3 at 22.48 and eventually Andrejs Maslovskis scored for the home team at 35.32. McKinney and Adam Greener picked up double minor penalties at 36.20 with Greener also picking up a 5+game penalty. The third period saw six goals scored, started by Dan Davies netting for the visitors at 45.32 and followed by McKinney scoring for Telford at 45.56. Pliskauskas scored his hat-trick goal at 46.44 and Doug Sheppard extended the lead at 49.18. Josh Bruce netted for Telford at 56.06 completing their scoring but Blaz Emersic scored Slough’s seventh at 57.09 to complete the game. Slough Jets lined up against one of the EPL new teams, Basingstoke Bison with both teams keen to set the season series early. The first forty minutes of the game saw little difference between the teams with just 1 shot on goal being the difference across the two periods. Basingstoke drew first blood when Ollie Bronniman scored at 11.04 but Carl Thompson levelled the game at 18.28 with a soft shot beating Tom Annetts. Peter Poljacek got the only penalty in a physical period at 20.00 with a roughing call to be served in the middle period. Again nothing could split the teams in the second until James Knight netted at 30.02 to give Slough their first taste of the lead but 5.01 later Bronniman scored again to level the game and the teams went to the second interval tied again. A spell of 1.15 in the third period swung the game in the visitors’ favour as three quick goals proved to be the deciding factor. Onrej Lauko netted at 45.35, Steve Moria struck home a lose puck at 46.17 and Jamie Line scored the game’s final goal at 46.50. Basingstoke closed up and played tight for the final 13.10 and despite Slough outshooting them 16-9 in the final period the visitors took full points from the game.